Yes. Chiropractic care is safe and effective throughout pregnancy. The techniques used are specifically designed to meet the needs of a pregnant woman's body, and are very gentle and low force. Protruding abdomen and increased back curve. Currently the International Chiropractic Pediatric Association recommends that women recieve Chiropractic care during pregnancy. Chiropractic care benefits all aspects of your body’s ability to be healthy. This is accomplished by working with the nervous system-the conduit of intelligence between your brain and body. Doctors of Chiropractic work to correct subluxations (misalignments) of the individual spinal bones. When subluxated, irritation on the spinal cord and/or spinal nerves may cause malfunction in other parts of the body and imbalance in surrounding muscles and ligaments. Dr. Larry Webster, Founder of the International Chiropractic Pediatric Association, discovered this technique as a safe means to restore proper pelvic balance and function for pregnant mothers. Many people do not realize that infants and children may need spinal adjustments, or that they can even be adjusted in the first place. However, children benefit from Chiropractic care the same as adults do. The human body, big and small, is controlled by the nervous system. The Birth Process: Being born is often one of the most traumatic events we go through. The confined space in the uterus, squeezing through the birth canal, and than being pulled by our necks as we are born, often leads to misalignments. Newborns should always be evaluated after birth. Reaching Milestones: As babies learn to roll, crawl, and walk, they often stumble and fall. These minor injuries can cause misalignments in the spine. Babies who are adjusted regularly may have less difficulty reaching milestones due to increased brain and body communication. Sport Injuries: Many injuries occur when children are involved in athletics. Occasionally, what seems a harmless injury can result in misalignments in the spine. Regular adjustments help children’s body’s better deal with these injuries and reach their full potential. Back Packs: Children often carry more than 10% of their body weight in their backpack. This weight, along with improper carrying, can result in muscle tension, and subluxations. Teaching children how to properly carry their backpacks to reduce strain, as well as regular visits to the chiropractor, can result in decreased muscle strain and pain. many germs and illnesses from other children. Any illness, regardless of how minor, puts strain on our systems. This stress can lead to misalignments in the spine. Spinal adjustments remove these misalignments. Research shows that regular chiropractic care can improve immune function, which can result in less sickness. 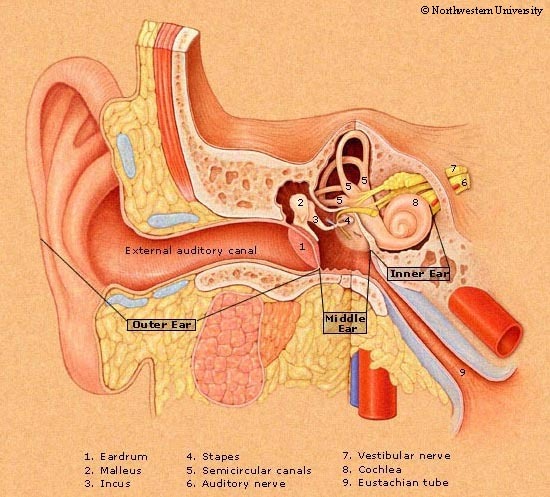 It is a middle ear inflammation, usually caused by an infection that blocks the Eustachian tube. During a cold, sinus or throat infection, or an allergy attack, the Eustachian tubes can become blocked, preventing ventilation and drainage of fluids from the middle ear. The resulting pain is highly distressful to young children…and their parents. Otitis Media is extremely common – seen most often in children 6 to 36 months of age. Up to 1/3 of the childhood population will have 6 or more episodes before starting school, and some can have up to 12 episodes in a year. Babies are particularly susceptible to ear infections because their Eustachian tubes are short (about ½ inch) and more horizontal. As they grow to adulthood, the tube triples in length to 1 ½ inches and become more vertical, so fluid can drain more easily. Every year in the United States, approximately 30% of children under the age of 3 receive antibiotic treatment for acute earache. In fact, treating earaches is the most common reason for outpatient use of antibiotics. But scientific studies have shown little evidence of shorter duration of symptoms, fewer recurrences or better long-term outcomes for children given antibiotics for their acute otitis media than those who did not receive antibiotic treatment. Moreover, researchers have found that giving so many children so much antibiotic medication promotes the emergence of microbes that are resistant to the very antibiotics that are being used. A chiropractic treatment plan featuring gentle adjustments and light neck massage appropriate for very young children, offers hope for comforting relief, without heavy use of antibiotics or surgery. Chiropractic adjustments and massage of the tissue surrounding the ear can help clear the Eustachian tubes blockage that causes otitis media. The chiropractic approach is an alternative to traditional medical treatments that may be less effective and involve serious side effects.